Achene: A small, dry indehiscent, 1- seeded fruit. Acute: Sharp, ending in a point. Fig. iii, B.
Amplexicaul: Clasping or embracing the stem. Androgynous: Having male and female flowers in the same inflorescence. Anther: The pollen-bearing part of the stamen. Apiculate: Having a short, sharp, pointed tip. Fig. iii, C.
Apressed: Closely and flatly pressed against an organ (as hairs on a leaf). Arachnoid: With slender, entangled hairs. Aril: An appendage or outer covering of a seed. Aristate: Provided with a stiff bristle. Fig. iii, A.
Attenuate: Long tapering. Fig. iii, J.
Axil: Upper angle formed by the union of stem and leaf. Axillary: Situated in the angle formed by the base of a leaf or petiole and the stem. Beak: A long prominent point, usually applied to a fruit appendage. Berry: pulpy, indehiscent, few- or many- seeded fruit with no true stone (e.g.tomato). Bract: A reduced leaf associated with the inflorescence. Calyx: The whorl of sepals. Capitate: In a head, aggregated into a compact cluster. Capsule: A simple, dry fruit formed by the fusion of 2 or more carpels. Fig. 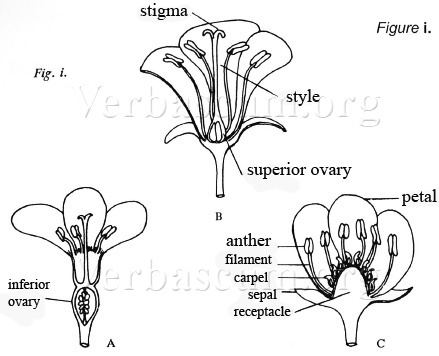 v. H.
Carpel: An ovule-bearing unit of a simple ovary in the female flower, 2 or more carpels may be fused to form a compound ovary. Carpophore: The stalk to which carpels are attached, in Umbelliferae a portion of the receptacle prolonged between the carpels. Caruncle: A small appendage at or near the point of attachment of a seed. Catkin: A hanging spike of small flowers, usually with scales between the flowers and often unisexual. Caudate: With a tail-like appendage. Fig.iii, G.
Caudex: The woody base of a perennial plant. Cauline: Belonging to the stem. Chasmophyte: A plant dwelling in cliff crevices. Ciliate: Bearing hairs on the margin. Fig. ii, J.
Coccus: One of the pmts of a lobed fruit with 1- seeded cells. Cordate: Heart-shaped. Fig. iii, N.
Corolla: The whorl of petals, often united into a tube. Corymbose: In a more or less flat-topped inflorescence with the outer flowers opening first. Fig. vi, B.
Crenate: With shallow, blunt teeth, scalloped. Fig. ii, B.
Crustaceous: With a hard, brittle texture. Culm: The jointed stem of grasses and sedges, usually hollow except at the attachment. Cyathium: The «flower» of Euphorbia consisting of a cup-like involucre containing the small, true flowers. Cyme: Broad, more or less flat-topped inflorescence in which the central flowers open first. Cypsela: The single-seeded fi11it of Compositae, derived from an inferior, unilocular ovary. Decurrent: extending down and fused to the stem or other organ. Decussate: Leaves in pairs alternately crossing at right angles. Deflexed: Reflexed or bent sha1ply downwards. Dentate: With sharp teeth at right angles to the margin. Fig. ii, E.
Denticulate: Finely dentate. Fig. ii, F.
Dichasium: A cyme-like inflorescence with 2 lateral axes. Fig. vi, H.
Dichotomous: Branching by equally forking in pairs. Dioecious: With male and female flowers on separate plants. Disc-floret: The central, tubular flowers in the heads of some Compositae. Drupe: A stone fruit, a single-seeded, indehiscent fruit with seed having a stony endocarp (drupaceous). Fig. v, C.
Ellipsoidal: Solid with an elliptical profile. Epicalyx: An extra calyx-like structure below the calyx. Endocarp: The inner layer of the fruit wall. Entire: With a continous margin. Fig. ii, A.
Erose: With an inegularly toothed or eroded margin as if bitten. Fig. ii, K.
Fascicle: A condensed close cluster. Flexuous: Having a wavy zig-zag form. Floccose: Covered with tufts of soft, woolly hairs. Follicle: Dry dehiscent fruit splitting only the dorsal side. Fig. v, G.
Glabrescent: Almost glabrous or becoming glabrous with age. Glaucous: Covered with a white bloom. Glomerule: A cluster of heads usually in a common involucre. Glume: One of a pair of sterile bracts at the base of a grass spikelet. Hastate: Arrow-shaped with the basal lobes turned outwards. Fig. iii, H.
Hemicryptophyte: Herbs with renewal buds at soil-level. Hermaphrodyte: With stamens and ovary in the same flower. Hispid: With rough hairs ofb1istles. Homogamous: With the simultaneous ripening of stamens and styles in the same flower. Hypogynous: Inserted beneath the female organs. Indumentum: A hairy or pubescent covering. Infelior: Below, usually an ovary located below the perianth. Fig. i, B.
Involucre: A whorl of bracts subtending a flower or inflorescence. Involute: Rolled in from the edges with the upper surface innermost. Keel: The lower, united petals in a leguminous flower. Labellum: The lip of an orchid flower. Lacerate: Irregularly cut at the edge. Laciniate: Deeply cut into narrow lobes separated by narrow, irregular incisions. Lanate: Woolly, with inte1woven curly hairs. Lanceolate: Lance-shaped, tape1ing at both ends with the widest part below the middle. Fig. viii, C.
Legume: A simple, superior fruit dehiscent into two valves. Fig. v, A.
Lemma: The lower of two bracts enclosing the grass flower. Linear: long and narrow with the margins more or less parallel. Fig. viii, A.
Lomentaceous: Having the Jiom of a flat legume constricted between the seeds, the legume falling apart at the constrictions when mature to give a number of 1-seeded segments. Fig. v, B.
Lyrate: Pinnatifid with the tem1inal lobe enlarged. Fig. viii, K.
Medifixed: Of hair fixed in the centre with either end free. Mericarp: One-seeded part of an ovary split off at maturity. Fig. v, I.
Monoecious: Having separate male and female flowers borne on the same plant. Mucronate: With a short, narrow point. Fig.III, D.
Oblanceolate: Lanceolate but broadest above the middle. Fig. viii, D.
Obovate: Ovate but with the distal end broader. Fig. viii, J.
Obtuse: Blunt or rounded. Fig. iii, E.
Orbicular: Flat with a circular outline. Fig. viii, H.
Palate: A rounded projection on the lower lip of some corollas which closes or almost closes the throat. Palea: The innermost bract of a grass floret. Palmate: Divided in a hand-like manner. Fig. iv, C.
Panicle: A branched racemose inflorescence. Fig. vi, B.
Pappus:The various tufts of hairs or scales on the on the apex of Compositae fruits, generally considered to be a modified calyx. Pedate: Palmately lobed with the lateral lobes again divided. Pedicel: The stalk of a single flower. Peduncle: The stalk of a flower cluster. Peltate: With the stalk arising towards the center rather than at the margin (of a leaf). Fig.iii,M. Pelianth: Collective term for the whorls of petals and sepals. Peligon: A perianth not differentiated into petals and sepals. Perygynium: Papery sheath enclosing the achene in sedges (Carex). Pilose: Shaggy, with soft hairs. Pinnate: Feather-like, as the leaflets of a compound leaf placed on either side of the rachis. Fig. iv, A, F.
Pinnatifid: Leaf divided ii1 a pinnate way but not cut to the midrib. Fig. iv, D.
Pinnatisect: Leaf divided ii1 a pilmate way but cut to the midrib. Fig. iv, E.
Polygamous: With unisexual and bisexual flowers on the same plant. Procumbent: Trailing, lying flat along the ground without rooting at the nodes. Pruinose: With a thick, white, flakey bloom. Quadrate: More or”less square in out-line. Raceme: Simple elongated inflorescence with the oldest flower at the base. Fig. vi, A.
Radiate: Spreading form a common centre. Radical: Arising from the root or crown. Ray-floret: the outer, ligulate florets ii1 a composite head. Receptacle: The modified apex of a stem bearing the floral parts. Reticulate: With a netted appearance. Retuse: Notched slightly at the apex. Fig. iii, F.
Revolute: Margin rolled downwards with the lower surface i1mermost. Rhomboidal: Diamond-shaped. Fig. viii, G.
Rugose: With a wrinkled surface. Runcinate: Coarsely sen-ate with the teeth pointing towards the base. Saggitate: Arrow-shaped with the lobes pointing towards the base. Fig. iii, I.
Samara: An indehiscent Winged fruit. Fig. v, D.
Scabrous: With short, rough hairs. Schizocarp: A dry, indehiscent fruit splitting into two valves. Fig. v, I.
Scorpioid: A coiled cluster in which the flowers are usually two-ranked. Fig. vi, G.
Serrate: With saw-like teeth which point forwards. Setaceous: Bristle-like, with a bristle. Shrublet: A small shtub (perennial). Silicula: Dry, dehiscent fruit of a Crucifer, not more than three times as long as broad. Fig. v,F. Siliqua: Dry, dehiscent fruit of a Crucifer, at least three times as long as broad, with two valves and a papety septum.Fig. v, E.
Sinuate: With a pronmmced wavy margin. Spadix: Thick, fleshy spike beating sessile flowers at the base and sunounded by a spathe (Arcaceae). Spathe: A large, sometimes coloured bract surrounding a spadix. Spathulate: Spoon-shaped. Fig. viii, B.
Spike: An unbranched inflorescence of more or less sessile flowers with the oldest flowers at the base. Spikelet: A secondary spike or the floral unit in a grass. Staminode: A sterile stamen which may in some cases be petal-Iike . Standard: The upper, broad petal of a leguminous flower. Stipule: The basal appendage of a petiole. Striate: With fine ridges, grooves or lines of colour. Strigose: With sharp-pointed, appressed, stiff hairs. Strophiole: An appendage at the point of attachment of certain seeds. Sub-: Slightly, as sub- dentate, slightly toothed. Subulate: Awl-shaped, tapering from base to apex. Superior: Applied to an ovary situated above the perianth. Fig. i, C.
Tendril: A slender, often coiled extension of stem or leaf used for climbing. Tepal: A undifferentiated perianth unit. Ternate: Divided into threes. Fig. iv, G.
Thyrse: A compact panicle in which the flowers of the lateral branches open from the outside inwards. Tomentose: Densely woolly or pubescent, with matted hairs. Trifoliate: Having compound leaves with three leaflets. Fig. iv, B.
Truncate: Ending abruptly, the apex or base more or less straight across. Fig. iii, L.
Tuberculate: With small tubers or lumps on the surface. Tunicate: Formed of concentric layers like the bulb of an onion, the outer loose coat is often referred to as a tunic. Umbel: A flat-topped inflorescence charrctetistic of the umbelliferae with the peduncles of more or less equal length and arising from a common point. Fig. vi, F, E.
Valve: One of the segments into which a capsule or pod naturally splits on maturity. Velutinous: With a velvety indumentum. Verticillaster: A whorl-like structure composed of a pair of opposed cymes as in the inflorescence of Labiatae. Fig. vi, F.
Villous: With long, unmatted, silky, straight hairs. Wing: Dry, flat extension of some seeds or stems, the lateral petals of a leguminous flower. Zygomorphic: irregular or bilaterally symmetrical, divisible into two halves in one plane only.